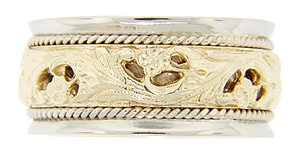 A yellow gold floral design is flanked white gold edges on this antique style 14K gold wedding band. The wedding ring measures 10mm in width. Size: 9. 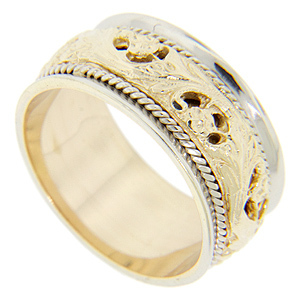 Cannot be re-sized, but we can reorder in a variety of sizes and in white gold, yellow gold and platinum.